Nylon bird netting and pigeon netting is used extensively as a bird exclusion device to protect both buildings and agricultural crops. Nylon bird netting and pigeon netting can be seen on buildings in towns and cities all over the world where it is used as a pigeon exclusion device; farmers also use bird netting extensively to protect valuable fruit crops from attack by wild birds. The main value of nylon pigeon nets in an urban environment where the protection of buildings is concerned is that it will blend in with the fascia of the building and maintain the aesthetic quality of the building concerned. In agricultural environments bird netting is often the only physical exclusion device available to farmers to protect fruit crops, although in many cases the use of netting will be complimented by bird scaring products such as predator balloons and noise-related devices. Nylon bird netting and pigeon netting is used to exclude a considerable number of different species of birds including pigeons, gulls, sparrows, starlings etc., with a different gauge of netting being required for each species of bird. For pigeons a 50mm (2”) gauge pigeon net will be required, for gulls 100mm (4”), for sparrows 19mm (3/4”) and for starlings 28mm (1 1/8th”). The different gauges are required to ensure that a) the hole is small enough to physically prevent the target species from entering the netted area and b) if the netting is provided horizontally the target species will not be able to perch or walk on the net. One of the main problems inherent with the use of nylon bird netting and pigeon netting for the protection of buildings is where more than one species is roosting on a building. For example, if a building has been protected against pigeons by using a 50mm pigeon net, starlings would be able to enter the netted area and roost or nest, potentially causing more entrenched problems for the property owner. 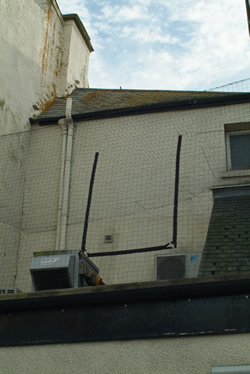 If, however, a 28mm starling net was provided in a horizontal application so that both species were excluded from the netted area, the mesh size would be small enough for pigeons to walk and perch on it resulting in continued problems for the property owner. Bird nets and pigeon nets used in the agricultural sector vary considerably in size and type dependent on the target species concerned and the type of crop or environment to be protected. Broadly speaking there are two different types of bird and pigeon netting available, ‘Oriented’ and ‘Extruded’ netting. Both types of netting are constructed from either polyethylene or polypropylene. ‘Oriented’ netting is stretched under controlled conditions to produce a high tensile and lightweight bird net which is normally used for horizontal applications. Applications would include crop or pond coverings, protection from predatory or nuisance birds or protection from light airborne debris. ‘Extruded’ plastic netting is manufactured in a continuous process resulting in a stable net structure where the hole size is held constant, unlike a woven or knitted product. ‘Extruded’ netting is usually used in vertical applications such as walls for pens, separation in water, filtration, predator control or physical barriers for fruit crops. Both ‘extruded’ and oriented’ netting is available in a wide range of sizes. ‘Oriented’ netting, the most commonly used of the two types, is usually available in sizes ranging from 5mm square (1/5”) through to 100mm square (4”), with the most commonly used size being 7mm (1/4”). ‘Extruded’ netting is available in two different shapes, diamond mesh or square mesh and usually ranges in size from 4mm (1/6”) through to 42mm (1 3/5”). Most types of nylon bird netting and pigeon netting that are used for bird proofing work are made from either polyethylene or polypropylene that has been stabilized against ultra violet light. The most common type of netting used for bird proofing is polyethylene UV stabilized net with a 12/6 twine. A flame retardant net is also commonly available and a majority of the various types and sizes of net can be fire-retarded on request. Many companies now offer fire-retarded net as standard. Although the ‘knotted’ type of polyethylene bird net has historically been the most commonly specified net for the purposes of bird proofing work, a new ‘knotless’ multi-strand polypropylene net has been designed which is both lighter and stronger than the ‘knotted’ polyethylene version. Knotless netting is approximately 70% stronger than conventional knotted polyethylene netting and is also 30% lighter. The product typically has a melting point that is nearly 50% higher than knotted polyethylene netting. These factors make the knotless netting cheaper to transport, easier to install and negates the need to pull the net into shape as is required with knotted polyethylene netting. The knotless net is often recommended for larger applications, particularly horizontal applications. Standard nylon bird and pigeon netting is 0.071” (18034mm) thick comprising of 6 strands that are 0.012” (0.3048mm) thick. The breaking strength of each strand of nylon is 23.6 kg (52lbs). The bursting strength is 22kg (44lbs). The product is highly resistant to most chemicals at standard temperatures and the high temperature range for the product is 100-115 degrees C (210-239 degrees F). Low temperature range is -95 to -110 degrees C (-139 to -166 degrees F). Most nylon bird netting is pre-stretched under 9 tons of tension and is then ‘heat set’. Heat setting involves stretching the net and then injecting steam over it for an extended period of time. This process will stretch the twine and tension all the knots to the point where they will retain their shape throughout the life of the product. Nylon bird nets and pigeon nets are available in a variety of different colours including black, ‘stone’ and translucent. A range of colours are offered for bird proofing applications in order that the net will blend in with the fabric of the building concerned. The product is barely visible from a vantage point of only a few metres if the product has been installed and maintained according to manufacturer’s recommendations. Nylon bird netting that is used in the agricultural sector is also available in a variety of colours but in many cases the colour of the net is of less importance than it would be when used to protect buildings. Nylon bird netting and pigeon netting is manufactured to withstand a wide range of weather and environmental conditions. 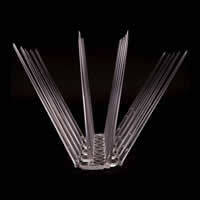 The product is chemically inert, will not rot nor absorb water and is UV protected. These factors ensure that in optimum conditions and assuming that the netting has been installed and maintained according to manufacturers’ recommendations and using a corrosion-resisting suspension system, nylon bird netting has a working life of 10 years or more according to one UK distributor. The installation of nylon bird nets in an agricultural application is relatively straightforward and although there are a huge number of installation permutations based on the variety of fruit/vegetable crops that are protected in this way, the basic installation process is similar in most cases. Nylon bird netting is normally installed in order to reduce scavenging from a multitude of different species of birds but it can also be used as an insect and animal control. It can be installed to protect ground-hugging plants such as strawberries, fruit bushes such as blackcurrants as well as fruit-bearing trees such as cherry and apple. Installation normally involves draping the netting over the plant to be protected with the netting being tied off in some cases and in other applications just left to lie loose. In larger applications bird netting will be provided via a suspension system. 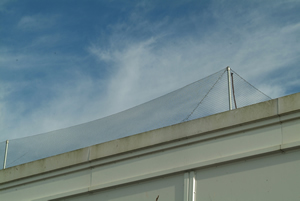 The installation of nylon bird netting and pigeon netting in an urban bird proofing application is very different to an agricultural application and can be a highly specialized process dependent on the height of the area to be protected and the extent of the bird-related problem being experienced. The process of installing nylon bird and pigeon netting on a building is every bit as important as choosing the correct gauge or colour of net required to exclude the target species, as well as to maintain the aesthetics of the building or site concerned. The lifespan of nylon bird netting is dependent, absolutely, on the quality of installation and the experience of the contractor used to provide and install the net. The effectiveness of nylon bird netting is based on how well versed the contractor is with the target species as well as the quality of installation. Nylon bird netting and pigeon netting is an extremely versatile product in a bird proofing application and can be used to protect vertical, sloping or horizontal surfaces. In the main, nylon bird netting has its main application where the protection of the fascia of a building is concerned and would normally be provided in a vertical application. The product is, however, sometimes used to protect roof areas where the net is suspended on poles or bolted to architectural features. Nylon bird netting can also be provided in box-section installations where, for example, a U-shaped section of a building is entirely netted with both vertical and horizontal surfaces being created. Nylon bird netting or pigeon netting is a product that is not normally recommended for home installation, due to the complexity of the installation and the wide range of tools and materials required to achieve a lasting installation. It will generally be necessary to engage a specialist contractor to undertake a home installation unless the area to be protected is small and the property owner is prepared to research the process and identify a source of the products required. With the advent of the internet, bird nets, pigeon nets and associated products are more widely available to property owners and it is possible to source the products with relative ease. Installing nylon bird netting or pigeon netting in a bird proofing application is a potentially complex operation and must be well thought through prior to starting work. In many cases nylon bird netting is provided at height and often in areas that are difficult to access, so it is important to ensure that specialist access equipment is available such as a scissor lift or ‘cherry picker’. Health and safety is also a major consideration and if a ‘home’ installation is being undertaken a thorough risk assessment should first be carried out. 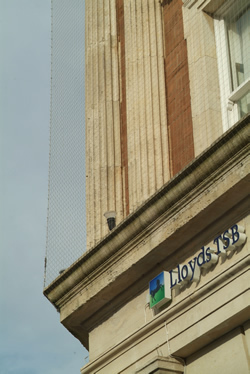 The basic principle of protecting a building with bird netting or pigeon netting is to completely exclude the target species from the netted area. To achieve this goal the netting has to be installed as per manufacturer’s recommendations and to an extremely high standard. The netting is held in place by a suspension system that involves the provision of highly tensioned steel or stainless steel wire rope around the periphery of the area to be protected. Once the wire has been installed and tensioned the netting is then attached to the wire by retaining clips called ‘hog rings’. The netting is pulled tight and square prior to the final retaining clips being installed. The netting is then checked to ensure that there are no gaps large enough for the target species to enter the netted area and this completes the installation. Prior to undertaking any works it is important to survey the building thoroughly in order to choose the correct hardware required to suit the fabric of the building concerned. Hardware will vary depending on whether the retaining wire is to be installed into wood, concrete or onto steelwork. In many cases the installation will involve installing the retaining bolts and clips into more than one material. When undertaking the installation of a square section of netting the 4 corners of the net would be supported by expanding eye bolts. These heavy-duty expanding bolts support the entire weight of the installation via an ‘eye’ on the bolt through which the retaining wire passes. Expanding eye bolts are available as ‘standard’ or ‘forged’ bolts, the latter being forged to offer greater strength. Expanding eye bolts would also be provided at any point where the retaining wire turns a corner or changes direction. For longer runs of retaining wire it is advisable to provide additional expanding eye bolts every 10-12 metres. Expanding eye bolts also support ‘cross-wires’ which are provided on larger installations as a secondary support for the netting. Expanding eye bolts should always be installed into a solid material wherever possible, such as brickwork or masonry on a conventional building, or into an I-beam if installing on a steel-clad structure such as a warehouse or the underside of a railway bridge. Expanding eye bolts are installed into masonry or brickwork by drilling an appropriately sized hole and inserting the bolt. The bolt is then tightened by turning the nut in order to expand the ‘shield’ on the bolt so that it is lodges tightly into the hole – the principle is the same as when using a raw plug to fix a screw into an internal wall of a house. If fixing into wood, galvanised or stainless steel ‘screw eyes’ would be used. If fixing into steelwork a ‘beam bolt’ is required. When drilling into a steel I-beam a drill bit with a carbide tip is recommended. When fixing to a ‘cladded’ building with a thin metal skin the corners of the installation still need to be fixed into a solid material or surface such as masonry, brickwork or steelwork. Once the expanding eye bolts have been installed the intermediate fixings will need to be provided. It is these fixings which hold the retaining wire close to the structure to be protected and stop the netting from bowing and leaving gaps through which birds could potentially enter the netted area. Intermediate fixings carry little if any weight and are simply there to guide the wire as it passes from one expanding eye bolt to another. As a result intermediate fixings tend to be less invasive to install. Intermediate fixings should be provided every metre (3 feet) for pigeons and gulls, every 0.5 metre (18”) for starlings and every 0.3 metres (12”) for sparrows, otherwise the target species will be able to access the netted area from behind the retaining wire. Anchor rivets and split pins or multi-purpose cable brackets (net hangers) are a low-profile fixing that can be used for installations in wood or concrete. Hilti hooks (metal hangers) are a higher profile fixing that is hammered into concrete, stone, brick or virtually any solid substance. Girder clips are normally used for installations on steelwork where it is not possible to drill or use cartridge tools. On a steel structure such as a steel-clad warehouse girder clips would be hammered onto the flange of an I-beam. Once the expanding eye bolts have been installed at the 4 corners and the intermediate fixings have been installed, the retaining wire is provided and tensioned. Retaining wire rope is available in either galvanized or stainless steel formats. In a majority of cases galvanized wire is mainly used to reduce the overall cost of the installation, but stainless steel wire should always be used if providing an installation anywhere near the sea. Once the type of wire has been selected, both ends of the retaining wire must be looped in order that they can be attached to the corner fixings and the barrel strainers or ‘turnbuckles’. The wire is then looped using copper ferrules which are crimped in place once the wire has been formed into a loop. For installations over 5 metres at least 2 ferrules should be used per loop. The purpose of the barrel strainers is to tension the retaining wire. Under normal circumstances, one barrel strainer would be used every 10 metres of retaining wire. The retaining wire is then fed through the eyes of the expanding eye bolts and barrel strainers are used to take out any slack in the wire and tension it. The retaining wire must be highly tensioned in order for the system to be effective. Once the retaining wire has been installed and tensioned the netting is ready to be attached to the retaining wire. This is achieved by using a small circular clip called a ‘hog ring’. Hog rings are usually installed by using a cartridge-fed hog ring stapler that works on a similar principle to a conventional paper stapler. Each square of mesh should be hog ringed to the retaining wire to ensure total security of the netted area. As the net is hog ringed to the retaining wire it is constantly stretched and tensioned to ensure that the netting is square and that there is no ‘play’ in the netting once the installation is complete. If access is required to areas behind the net there are two types of access device that can be fitted to a net to provide access. The first is a stainless steel clip that can be removed and replaced as and when access is required and which is normally available in 3 sizes to match the gauge of net being installed (19mm, 28mm and 50mm). The clip is installed in the precise area of the net where access is required and then the net is cut in the middle of the span of the clip. 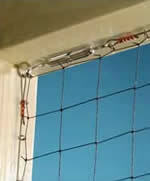 The second option is a bird net zip made of non-corrosive materials. A bird net zip is no different from a conventional zip and is either hog ringed or sewn in place. Zips are typically available in 2 sizes to match the gauge of net being used (28mm and 50mm). The net is first installed and then the zip is attached in the desired area. Once the zip has been installed the mesh behind the zip is cut creating the access hole. The Department of the Environment, Food and Rural Affairs (DEFRA) is the UK’s Government body that oversees the Wildlife and Countryside Act and produces legislation to which the pest control industry must adhere. The following information is taken from a document provided on DEFR A website entitled: ‘Review of international research regarding the effectiveness of auditory bird scaring techniques and potential alternatives’. By J Bishop, H McKay, D Parrott and J Allan. The type of bird netting used in agricultural and garden applications tends to vary from netting used for urban bird proofing applications. There is a huge variety of different gauges and types of net available and each net type and each different gauge is designed to exclude a specific species of bird. Most netting sold for the purpose of protecting crops, gardens and garden ponds is available by the metre or in rolls of 100 metres and in a range of widths including: 4 metre, 6 metre, 8 metre and 12 metre. 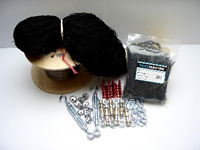 Netting used to protect buildings is commonly available in two formats; a kit which typically includes a specific metreage of net plus fittings (and in some cases tools as well) and also by the square metre. For ‘home’ installations and for the protection of smaller areas the kits are ideal, but for larger areas netting would normally be sourced by the square metre from a supplier of pest control products or from an installation contractor who would also install the net. Most retail outlets that sell installation kits also sell net by the metre but it must be understood that all the fixtures and tools required will need to be sourced separately. For the average home installer, specialist advice would almost certainly be required. Most suppliers will offer a made to measure service when buying net by the metre so it is important to measure the area to be protected prior to ordering the net. If you are able to provide a user review for bird or pigeon netting please contact the Pigeon Control Resource Centre. “Bird netting is one of the most popular methods used for preventing pest urban birds from getting onto buildings. Its success is due principally to the fact that if it is correctly installed, it is virtually the only system that can be used with confidence in areas subject to high levels of ‘bird pressure’. Nylon bird netting and pigeon netting can be a highly effective bird exclusion system for a variety of different applications ranging from the protection of crops and gardens through to the protection of buildings. It is a product that is widely available in kit form for smaller installations or as a stand-alone product for larger and more complex installations. Nylon bird netting and pigeon netting in an urban bird proofing context does not normally lend itself to a ‘home’ or DIY installation unless the area to be protected is small and access to the area is straightforward, without the need to use specialist access equipment. 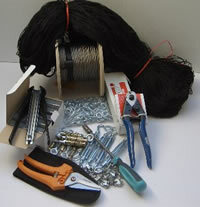 Having said this, all the products required to install netting to a building, including the net and all the tools and fittings, are widely available on the internet. Detailed information and installation instructions are also relatively easy to source via the internet. The main dangers of a ‘home’ installation is usually a lack of understanding of the bird species concerned and how the birds will react and respond to being excluded from their roosting and perching sites. There is also the risk of breaking the law by trapping birds behind the netting or within the netting itself. Virtually every pest control contractor will supply and install nylon bird netting and in many cases will recommend this product over and above others due to the profitability of the service. In most cases nylon bird netting will be the most expensive bird exclusion product available to those experiencing a bird-related problem and it is not always the most appropriate product. One of the main advantages of nylon bird netting and pigeon netting is the fact that the product is virtually invisible to the naked eye and can be sourced in a variety of colours that will blend with the fabric of the building concerned. The downside of the product is that it will require regular maintenance, it can be extremely expensive to install and there is potential for birds to become trapped in or behind the netting whether or not the net has been installed professionally. or repair work. Most pest control contractors and suppliers of nylon bird netting and pigeon netting offer a 10-year guarantee for the net they supply and/or install, providing that the net is installed and maintained according to manufacturer’s guidelines. Although this may appear to be a generous guarantee, it must be understood that if the netting has been poorly installed the guarantee will be worthless. The cost of installing netting in an inaccessible area, including the cost of regular maintenance regimes, may be considered to be high relative to anti-perching products such as the anti-roosing spike which require no maintenance and have a much longer lifespan. 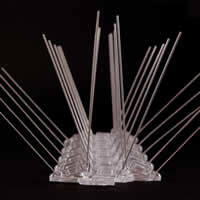 These can be purchased from an online retailer such as Defender Bird Spikes. 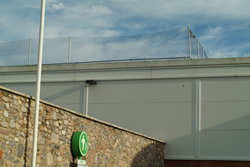 Where nylon bird netting is provided in box installations, such as protecting plant on roofs or where the U-shaped rear courtyard of a building is entirely netted, thought must be given to how the netted areas can be accessed for essential maintenance work. In many cases contractors working on site will simply cut through netting in order to gain access to plant or other equipment within the netted area. Zips can be provided in netting but they are very flimsy and often break or come away from the netting that they are sewn in to, resulting in a gaping hole through which birds will enter. Even if a zip is provided for access, many contractors will walk away from the job without closing the zip resulting in the same problem. When it is understood that the integrity of any net is based on it being highly tensioned, any article such as a zip that is provided within the net will inevitably be a weak point. Netting is also recommended for the protection of roof areas where a large net is provided on some type of suspension system. Where nets are provided in a vertical application against the skyline there is a constant risk of birds flying into the net and injuring themselves or becoming trapped. If a clear net is used, and particularly if the netting is suspended above the roof line, birds will fly into it. If netting is highly tensioned, as it should be if it has been regularly maintained, birds will bounce off the net and although stunned are unlikely to injure themselves. If the netting has degraded, however, any bird that flies into the net will become tangled and trapped. Regular maintenance of netting is critical where roof applications are concerned. If netting is allowed to stretch and become baggy when provided to protect a roof, the net will sag and lie on the roof tiles or the ridge tiles resulting in birds being able to perch on top of the net. Where netting is provided in a skyline application there is often a requirement for Planning Permission from the local authority. If netting is provided to protect a roof or glass atrium the suspension system may extend above the roof line and as a result may not be allowed. Similarly, if netting is considered to protect a Listed Building permission from the Listed Buildings Officer will almost certainly be required. Where nylon bird netting and pigeon netting is used to protect the underside of a bridge for example, products will normally be installed that are designed to allow any trapped bird to exit the netted area without being able to re-enter. 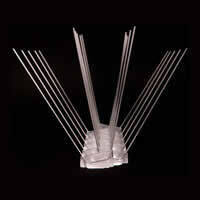 These 1-way devices appear to resolve many of the problems associated with trapping birds behind netting installations. Unfortunately they are very rarely ever found or used by the trapped birds. Most pest control contractors and netting installers deal with the issue of trapped birds behind netting installations by shooting the trapped birds rather relying on 1-way devices. As with every pest control product, the quality of installation is the key to long life and effectiveness, as is the knowledge and experience of the contractor instructed to supply and fit the product. Although nylon bird netting and pigeon netting can be an extremely effective and aesthetically pleasing product when installed with vision and as per manufacturer’s recommendations, it can also be a massive liability if installed poorly and if not maintained regularly. Nylon bird netting receives far more negative than positive press and is constantly in the news in situations where birds have become trapped within the net itself or in areas behind the net. Organisations like the Pigeon Control Advisory Service, the RSPB and the RSPCA receive 1000’s of calls each year concerning birds that have become trapped in degraded or poorly installed bird netting. Most property owners that have nylon bird netting or pigeon netting installed are unaware that it is they that are responsible and legally liable should a bird, or birds, become trapped in netting installed on their behalf, not the contractor that installed the net. The Wildlife and Countryside Act makes it an offence to place any article in such a position, either deliberately or otherwise, so that it traps or injures a wild bird or animal and the penalties for doing so are severe. The Animal Welfare Act 2006 also makes it an offence to cause suffering to any animal or bird. Where nylon bird netting or pigeon netting is used to exclude birds from an area where they have been roosting and breeding extra care must be taken when installing this product. The feral pigeon is the most commonly controlled urban bird and it is not unusual to find literally hundreds of birds resident under railway/river bridges and in derelict or partially-used buildings. As the feral pigeon breeds all year round there will never be a ‘safe’ time to exclude adult birds without the risk of trapping flightless birds. In these situations all flightless birds should be removed prior to installation works being undertaken. If flightless (or adult) birds are trapped within the netted area during the installation process, which is extremely common, once again it is the property owner that is legally liable, not the contractor. In summary, there are clear advantages and disadvantages to the use of nylon bird netting or pigeon netting as a bird exclusion device. When considering the product as an option, however, it is vital to explore all the various exclusion, scaring and anti-perching devices available. Independent advice should always be sought wherever possible and when assessing costs associated with a netting installation consideration should always be given to the initial cost of installation, the cost of regular maintenance and the cost of replacing the product at the end of its 10-year life span. It should also be understood that if the product is poorly installed the life-span will be dramatically reduced. The use of nylon bird netting in an agricultural or garden application is far more straightforward than urban installations with common sense playing a major part of the installation process. It is quite clear that nylon bird netting has wide-ranging applications where the protection of crops, gardens or ponds is concerned. As with many pest control products, however, nylon bird netting may need to be provided in conjunction with other products in order to assure complete effectiveness, but it does have credibility as a stand-alone exclusion device. Nylon bird netting has clear advantages over pure scaring products such as predator balloons, but can also be easily damaged by weather conditions including strong winds and snow. Once damaged nylon netting quickly becomes ineffective and where large areas are protected by netting systems small rips and tears may not be noticed, allowing birds and animals access to exploit valuable crops. Providing that the correct type and gauge of net is chosen nylon bird netting can be extremely effective. The cost of protecting large fields of crops can be prohibitive, depending on the support system chosen, and the work involved with setting up the netting system and then removing it prior to harvest can also be time consuming and expensive. DEFRA’s view is that the use of netting for commercial agricultural applications may only be appropriate for the most valuable crops. As well as the cost of providing a large-scale netting system, the issue of access to the netted area also needs to be taken into consideration. If mechanical access is required on a regular basis throughout the growing season then netting may not be the most appropriate control. As with the use of nylon bird netting or pigeon netting in an urban bird proofing application, the issue of trapping or injuring wildlife is a major factor. DEFRA suggests that netting must be checked regularly to ensure birds and animals have not become trapped, but the reality is that few farmers will have the time or the resource to carry out these checks on anything other than an ad hoc basis. The Wildlife and Countryside Act 1981 makes it an offence to place any article in such a position, either deliberately or otherwise, so that it traps or injures a wild bird or animal and the penalties for doing so are severe. The Animal Welfare Act 2006 also makes it an offence to cause suffering to any animal or bird. 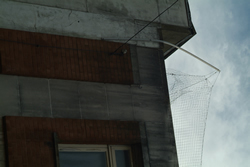 In summary, nylon bird netting can be an extremely effective bird (and animal) exclusion device but, as with urban bird proofing applications, attention must be paid to costs associated with provision of the system, maintaining the system and replacing the system once it has degraded and become ineffective. Attention must also be paid to providing the correct type and gauge of mesh to suit the target species. Issues such as degradation from severe weather conditions, mechanical access to the netted area and causing harm to wildlife must also be considered.